Mobile apps are the most powerful marketing mediums available to businesses right now. There is nothing that can communicate instantly with your customer base like an app can do and this alone enables you to manage your business much more efficiently. You can easily leverage your current customers social networks to spread the word about your amazing services and products. Apps are very useful tools to enhance your business visibility, keeping your customers loyal, engaged and returning to your doors. Is a mobile-friendly website enough? An official business website is the traditional foundation of your online presence. Ensuring that your website is mobile friendly and adapts to all screen sizes is also critical. However, most websites are geared solely for customer discovery and detailing services. A mobile app utilizes smartphone and tablet device capabilities to give business owners a direct communication channel straight to your customer’s pocket. How will my mobile app benefit my business? The bottom line for mobile apps is that they increase revenue. By making it easy for customers to contact your business, visit your location, learn about your promotions, and promote referrals… you can increase your revenue. Because apps are mobile, your customers can do any of these things from any location, which makes your business more accessible than ever before. Mobile coupons are redeemed at 10 times the rate of print coupons. 70% of people contact a business after a mobile search, but almost half will head to a competing business if the mobile experience is poor. Mobile apps increase customer satisfaction, especially those that include a customer rewards program, which increases customer retention, positive reviews, and referral rates. Loyalty programs can increase sales by 20% or more! They increase social media engagement by making it easy to post and share about your business. Naturally turn your customers into brand promoters and help boost revenue. Push notifications have been found to lead to a 30% increase in social media engagement. Customers have come to expect mobile interaction from almost every business. By offering a mobile app, you can get ahead of the competitors that do not. They also increase operational efficiency by letting customers send inquiries, submit orders, and request reservations or appointments. You can reduce the amount of phone time for your team members and streamline operations. You can also track customer activity and identify areas to improve. Having a direct and regular connection channel to customers deepens the bonds between them and your business, boosting loyalty. In short, mobile technology is surprisingly powerful and can generate a wealth of opportunities for your business. Will my mobile app be in my name in the app stores? Absolutely! It is very important that your clients see and install your mobile app in your name, not a generic name or carrier’s name. Your app will be in your businesses name with your logo – what a powerful way to promote your businesses branding! The icon on your customer’s smartphone or tablet device will be your logo/icon, which is valuable advertising space. Imagine your own icon on your clients smartphone – that prime real estate! How can I promote my mobile app to my customers? All of our published mobile apps include a tailored launch package and we train you exactly how to increase the number of people downloading your app. We also show you how to leverage your mobile app on your social media channels to increase your business visibility. We have several powerful time-tested marketing strategies that we can implement on your behalf to ensure your app is downloaded as fast as possible. Once your app is published, we provide you with download links, QR codes, and a set of printed marketing assets that you can use to get the word out to your customers. There are several ways to entice your customers to download your mobile app. We will custom design these marketing strategies with your business branding before your app is launched to the public. We make the entire process as easy as possible. To begin, please review our mobile apps pricing guide to review our device platform options and mobile features. Then complete the free consultation request form at the bottom of the pricing page and we will contact you to coordinate a no-obligation consultation at a time that suits your busy schedule. Alternatively, you can also call us directly at 404-998-3191 to set up your free consultation. Our free consultation meeting is focused to discuss your business and mobile marketing needs. We will provide a demonstration of the mobile features you are interested in and answer all your questions about our mobile solutions. If your business is in the greater Atlanta area, we will come to your location. We will also gather the information you would like in your mobile app: business information, logo designs, photos, and anything else you wish to include within your mobile app. We then build your mobile app while you continue to focus on running your business! You will have complete visibility of your mobile app being built at every stage of the process. Our pricing is based on the device platforms you want your app published on and the features you choose to use. There is a one time setup fee to get your app created and published. We do not waste your valuable time or money on unnecessary project management hours. We keep our mobile app plans extremely affordable and you will be amazed at what the mobile program brings to your business. We build the best mobile apps at a fraction of what large software development firms charge. We have streamlined our mobile app service to make them as affordable as possible for businesses and organizations. The cost to get your mobile app published is based on a small one-time setup fee, the device platforms you want your app published on, and the premium features you choose to include. You are not forced to include app features that you do not wish to use. If you want to add, modify, or remove premium features at a later date, we can easily make those arrangements happen without negatively impacting your customers. Please visit our pricing guide for additional information. The app subscription plan includes: Hosting your mobile app on our servers and the app marketplaces your app is published to. It also includes detailed app usage analytics and our app support program where we ensure your app receives the latest software updates to continue running on Apple and Google devices without interruption. What type of support can I expect once my app is published? Rest assured that you are never alone and we are constantly by your side to ensure the success of your mobile marketing solution. We provide continuous customer support for assistance to guarantee your app is accessible to your customers. If you need to make significant changes to the app at any time, simply contact us for what you would like to change and we can discuss your requirements. What if I want to change something in my app? We provide you with access and training to change as many features and content as you want! Or you can subscribe to our Concierge Service plan and we will take care of everything for you, including: regular content publishing, push notifications, SMS notifications, event publishing, and more! Geofence Notifications are messages sent to your customers when they enter, leave, or remain in specific geographic areas. Business owners have the ability to create multiple geofenced areas to trigger automatic messaging directly to their customers. Create a geofence around your business location, a nearby competitor, a popular local venue, etc. 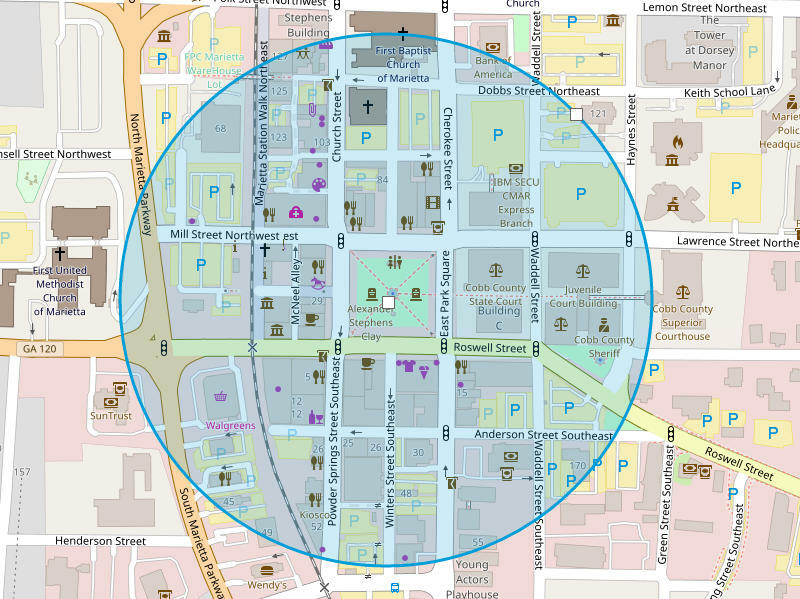 In the example below, a Geofence has been created around downtown Marietta Square. When an app user enters and remains within the selected area, custom messages will be sent. Beacons are small physical devices that use smartphone Bluetooth signals and are paired with your mobile app. 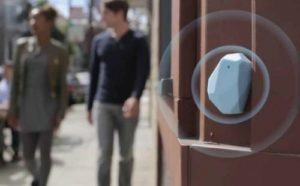 While Geofences cover wide geographic areas, Beacons transmit down to a few feet in distance, which makes them ideal for use inside your business or shop. The device range, messages, and scheduling are all customizable. We use Estimote Beacons in our mobile apps and provide them as either a device rental or purchase. Rentals are fully supported by our team and we provide new battery installation or beacon device replacement if necessary. You can easily send push notifications to anyone that has your mobile app installed. Notifications can include: a text message, photos, coupons, videos, and links to special content. A push notification can be used to let customers know you have a limited special offer, a new product, a special event or so many other things. The notification pops up on the user’s screen, it is unobtrusive and can either be viewed by the user or skipped. Our superior push messaging can be used to send to all customers, target nearby customers, or target geofenced areas so messages only appear when they enter or leave specific physical locations. Push notifications are a powerful way to stay engaged with your customers. If used properly, you can see an increase in retention numbers through using push notifications. We make it easy to send your push notifications. You can either do this yourself or we can do it for you! Can my customers make payments through the app? Yes! We can include payment and e-commerce options into your mobile app to allow your customers to make payments through your mobile app. SSL (Secure Sockets Layer) is the standard security technology for establishing an encrypted link between a web server and a browser, via HTTPS. This link ensures that all data passed between the web server and browsers remain private. SSL is an industry standard and is used by millions of websites in the protection of their online transactions with customers. Google ranks SSL Encrypted sites slightly higher in their search results. Mythos Media provides every mobile app project control panel and PWA with SSL Encryption for secured traffic. How long will it take to build and publish my app? We will typically be able to send you a live demonstration of your new mobile app within two business days. Once you have approved the design or your changes have been made, we will be ready to publish on the device platforms of your choice. The review and approval process can take time before the app is made public on the app stores. Android – Usually approved on Google Play within 24 to 48 hours. iOS – The approval process by Apple is very strict and can take up to 14 days. WebApp – The WebApp edition is hosted through our servers and publically available instantly. If you choose to use the WebApp as the mobile friendly version of your main website, we coordinate with you to ensure mobile web users are routed correctly. What happens when new versions of Android or iOS are released? We always keep your mobile app updated to include the latest updates of operating systems as part of your subscription. Will my app be free to download? Yes! Your mobile app will be published as a free download on the app stores of your choice with no limits to the number of user downloads. How will I know if my customers are using my app? You can view your download statistics through your dashboard once your app is published. We will also send you monthly statistics of your mobile app performance. For any other questions, please write us at info@mythosmedia.us or call 404-998-3191.